Transporting pet supplies–and the occasional bunny–is routine for pilot Maria de Silva. Discovering drugs amidst her shipments of kitty litter is not. Out of fuel in the Oregon wilderness, Maria barely escapes with her life when dealers meet her on the runway. She finds refuge at Cy Sheridan’s idyllic animal sanctuary–a whole new world for this city girl. But Maria fears that her drug-smuggling client will take revenge against the man–and animals–she’s come to love. Is there a wolf in sheep’s clothing lurking in the woods? 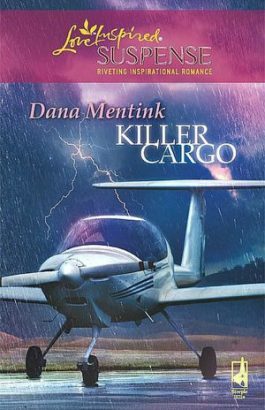 “Killer Cargo is Dana Mentink’s first romantic suspense title for Steeple Hill released hot on the heels of her cozy mystery, Trouble Up Finney’s Nose from Heartsong Presents Mysteries. A terrific book by the way. You’ll want to purchase that one too. Killer Cargo opens with pilot Maria de Silva sitting in her small plane on the tarmac waiting for her contacts to arrive and off load her cargo of pet supplies. As she waits, she discovers an unmarked package mixed in with her cargo. Marie can’t resist opening the box, learning it contains far more than pet food. The box is filled with drugs and fills her with fear. She snatches up Homer the three-legged rabbit that is destined to be a snake’s dinner and abandons the plane just as her contact arrives. Maria, desperate to escape the drug dealers, borrows a car and charges into the unknown Oregon wilderness. Racing into the One Word animal sanctuary, she crashes into Cy Sheridan’s stream and his life. Cy takes Maria in and introduces this city girl to his idyllic life among the animals. In return, she involves Cy in her plight and together they must evade her drug-smuggling client who thinks Maria took something of value when she fled. And I’m not talking about Homer. What follows is an intense, suspenseful read.